From the time he was a little boy, all Will Lewis wanted to do was ride a rocket ship to the stars. Now, more than three decades later, NASA Commander William Jordan Lewis prepares to lead his STS-777 Pursuit shuttle crew on a six-week mission to the International Space Station. Nothing and no one will interfere with his single-minded purpose…until four months before his mission, Will meets the girl next door, a petite beauty with a southern accent and a masculine-sounding name who challenges and completely captivates him. 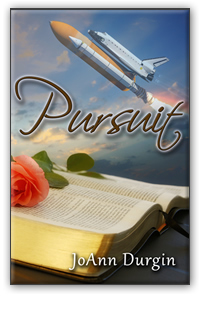 From USA Today Bestselling Author, JoAnn Durgin, join the journey in Pursuit, the eighth installment of the beloved Lewis Legacy Series as Commander Lewis discovers how one person’s faith can change the world.